My MacBook gives me all I really need, being both my main machine at work and the most important piece of hardware when I’m producing music. Any hidden talents or party tricks? Colin does an uncanny Christopher Walken impression, and a surprisingly decent impression of a young Eddie Murphy. Colin was born and raised in Golden, Colorado. As a kid, he fell in love with sports and music, playing basketball, football, tennis and golf throughout his childhood. In high school, he picked up a guitar and quickly developed a passion for creating music– a passion he still holds today. After graduating high school, he enrolled at the University of Colorado. It was there where Colin developed a love for web design and development. He became obsessed with creative technology when he was first introduced to it through his minor program in Technology, Arts and Media. Once he got his feet wet in graphic design and web development, he began fervently teaching himself more about these practices and honing his skills in his free time. 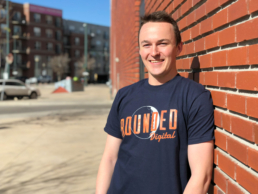 Going into his junior year of college, Colin started his own boutique digital agency, Goldrock Creative, which specializes in custom web development and video production. He ran Goldrock Creative for three years prior to joining Rounded. Colin graduated Phi Beta Kappa from CU Boulder with a degree in Economics and a minor in Technology, Arts, and Media. Colin brings a keen, refined eye for web design, a deep knowledge of web development, and an eclectic taste in music to the Rounded team. When he’s not crafting a beautiful new User Experience or geeking over the latest web development trends, you can probably find Colin in his home studio producing music.